The next generation of aeration technology is here. The SDOX utilizes a pressurized process to rapidly and efficiently dissolve oxygen in sidestream – offering multiple benefits in a host of municipal, industrial, and ecological water treatment applications. The SDOX® is designed to take a sidestream from the main process, saturate it with oxygen, and re-inject the “supersaturated” solution back into the main flow such that is effectively mixed and distributed in the process. By leveraging Henry’s law, we are able to cost-effectively provide control of aeration levels through oxygen dissolution and injection for a variety of water and wastewater processes and applications. We provide fully-integrated skids that simplify both the design and construction process, and we have several options available for materials of construction and instrumentation control. 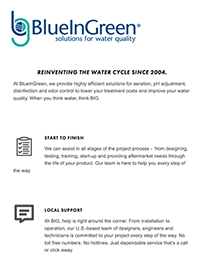 In addition to dissolution and injection systems, BlueInGreen can also provide on-site oxygen generation or oxygen storage tanks and vaporizers, as well as any other required ancillaries for a complete and functional solution.